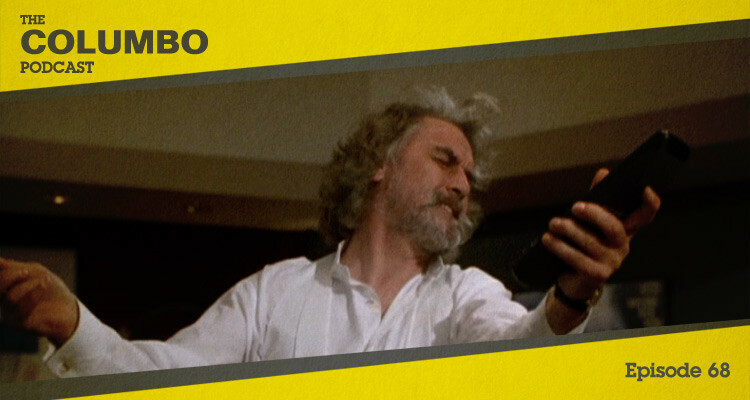 Legendary Scottish comedian and actor Billy Connolly was handed the killer’s gloves as Columbo returned after a two-and-a-half year hiatus with a clunking, ill-conceived disaster of an episode. Connolly’s Findlay Crawford is a composer of film soundtracks who has been propped up in recent years by the uncredited work of his protégé Gabriel McEnery (Chad Willett) as his own talents waned. Threatened with exposure of this charade, Crawford kills McEnery using a long-abandoned elevator to knock him off the roof of a concert venue while apparently on-stage. Richard Riehle makes his second and final Columbo appearance as Sergeant Degarmo, while additional support is provided by Charles Cioffi as movie director Sidney Ritter and Hillary Danner as McEnery’s girlfriend Rebecca. Obi Ndefo plays sound engineer Nathaniel Murphy, while Miguel Pérez is uncredited as security guard Freddie. Patrick McGoohan returns for his final stint as director, working (and apparently heavily adapting) the work of writer Jeffrey Cava (who apparently was not best pleased at the result). If you have thoughts on any aspect of Murder with Too Many Notes, please share them below, or find us on Twitter at @columbopodcast. Murder with Too Many Notes was released in 2001. It is 88 minutes long and originally aired on the ABC network. This episode is not available on Netflix, but can be found on the Season 10 or complete collection DVD box sets from Universal (all remaining episodes are considered ‘Season 10’ in the DVD collection).